Here is #9 from the Re-ment "Mom's Kitchen" series from 2005. 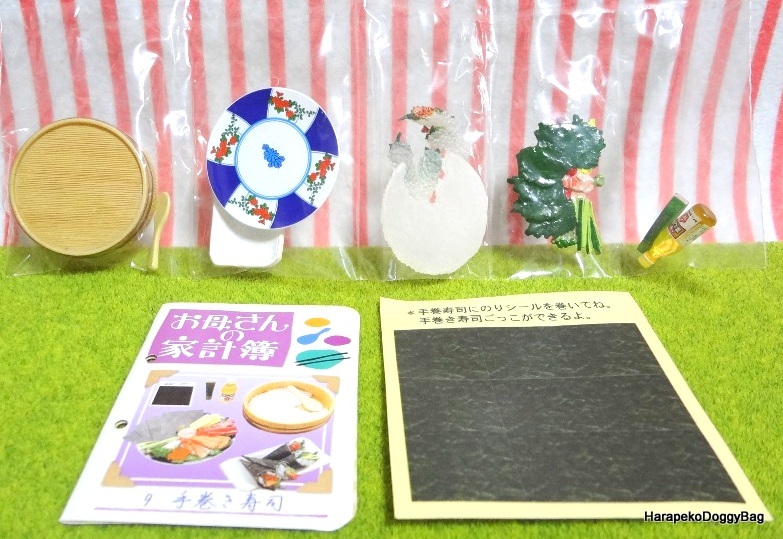 Keywords: Re-ment, Rement, Japanese Toys, Miniature, Miniatures, Dollhouse, Doll House, Puchi, Mini, Kawaii, Cute, Mom's Kitchen, Japanese Food, Cooking, Temaki Sushi, Hand-Rolled Sushi, Hangiri Sushi Oke Bowl, Shamoji, Spoon, Wasabi Tube, Rice Vinegar Bottle, Nori, Seaweed Sheet, Rice, Fish. Below is a sample photo of a new set with the info card and the "seaweed" sheet.